Native timber project breathes new life into Northland history - Family politics, a 120-year-old love story and modern-day research to see if native wood can be harvested sustainably for commercial use have converged in an historic church in Northland’s Matauri Bay. 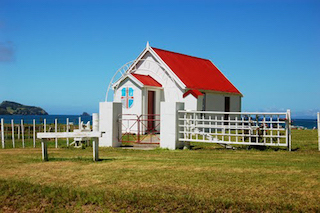 The iconic Samuel Marsden Maori Anglican Church building is dedicated to the memory of Reverend Samuel Marsden, whose early missionary success can in part be attributed to chief Ruatara who provided the preacher a safe place to rest at Matauri. Marsden then sailed on to hold the first official New Zealand church service at Rangihoua in the Bay of Islands on Christmas Day, 1814. The final step in the recent renovation of the 123-year-old building was a thanksgiving service held for a wooden floor made from totara harvested on the Kaeo farm of John McGee.